How popular is the baby name Jeremy in the United States right now? How popular was it historically? Find out using the graph below! Plus, check out all the blog posts that mention the name Jeremy. How has the ratio of Biblical names to non-Biblical names changed over time (if at all) among the most popular baby names in the U.S.? This question popped into my head recently, so I thought I’d take a look at the data. We’ll do boy names today and girl names tomorrow. First, let’s set some parameters. For these posts, “Biblical” names are personal names (belonging to either humans or archangels) mentioned in the Bible, plus all derivatives of these names, plus any other name with a specifically Biblical origin (e.g., Jordan, Sharon, Genesis). The “most popular” names are the top 20, and “over time” is the span of a century. 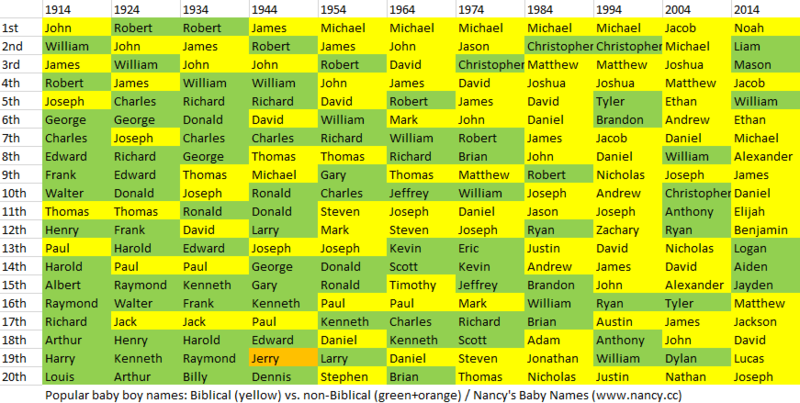 Popular boy names over time: Biblical (yellow) vs. non-Biblical. Click to enlarge. It felt strange putting an overtly Christian name like Christopher in the non-Biblical category, but it doesn’t appear anywhere in the Bible, so…that’s where it goes. But there’s a huge difference between sample sizes of 40% and 14%, so let’s also take a look at the 2014 top 100, which covers 42% of male births. 50%-50% isn’t quite as extreme as 70%-30%, but it’s still noticeably more Biblical than 1914’s 25%-75%. Do any of these results surprise you?